button is about 1.3 cm in diameter; dc stitch is 0.8 cm high. 15 buttons and 1 toggle ring long necklace is 15'' (36 cm) long; one button adds 7/8'' (2.3 cm) in length; add or eliminate buttons to make your own size. Influenced by Celtic ornaments this necklace is an attention magnet. 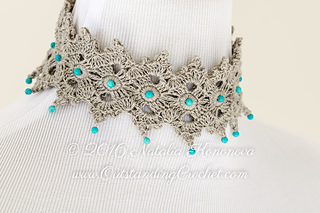 Fiber necklace is soft unlike metal. Please, note: this pattern is also available as part of a set, accompanied by a bracelet, with a discount. ch (chain), sl st (slip stitch), sc (single crochet), hdc (half double crochet), dc (double crochet), 2 dc tog (2 double crochet together), 5 dc tog (5 double crochet together). Instructions are given in English language, American terminology. 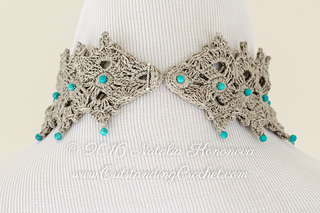 If you are not familiar with crochet charts, you can follow step-by-step-pictures and written instructions, given under each image. 10 g / ½ oz / 60 m / 66 yards of linen 3 ply yarn (YarnStories on Etsy, 3.4 oz / 100 g / 656 yards / 600 m) in 104 Natural color or cotton crochet thread size 10. 28 (30, 32) size 4 mm round beads, shown here – howlite dyed turquoise; add or eliminate 2 beads for every button if your size is not listed; shown here – howlite dyed turquoise. ½’’ (1.3 cm) necklace/bracelet toggle clasp. Matching yarn color sewing thread, tapestry needle, hand-sewing needle size to go through beads, stitch marker. Necklace: 14 (15, 16) buttons and 1 toggle ring / 12 ½ (13 3/8, 14 ¼)’’ / 31.8 (34, 36.2) cm long and 2 3/8’’ (6 cm) wide, made with 1 mm hook. Take measurement at the base of neck. Later in the pattern sizes 31.8 (34, 36.2). Each button adds about 7/8’’ (2.2 cm) in length; add or eliminate buttons to make your own size if it’s not listed. To check gauge make 2 buttons. There should be about 7/8’’ (2.2 cm) bet centers. My biggest gratitude for your interest in my pattern! 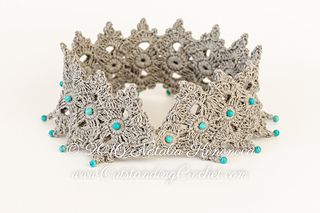 Thanks for visiting my shop OutstandingCrochet! © All patterns in this shop OutstandingCrochet.etsy.com are copyrighted by and intellectual property of Natalia Kononova. Please, do not share my pattern as it takes a lot of hard work and time to learn skills, required for designing, writing, photographing and putting together crochet patterns. Copyright violation is not a victim-less crime! Purchasing the patterns does not remove the copyright protection of that pattern but gives you only the right to make items from it. Do not copy, share, resell, or forward this pattern to anyone. No part of this work may be reproduced, transmitted, translated or published in any form or by any means without prior written permission. This material can not be used for any type of mass production/ manufacturing!